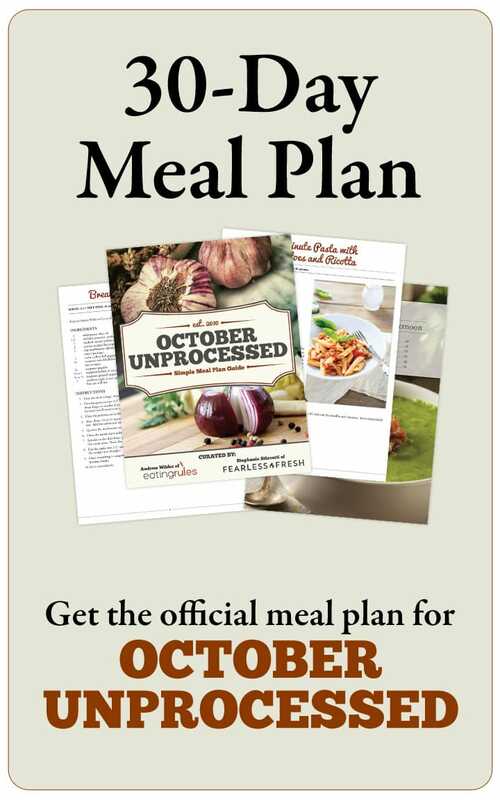 Home » October Unprocessed Posts » Get The October Unprocessed Meal Plan! Do you feel intimidated by a new way of eating? Have you been wondering exactly what you’re going to eat for the next month? Are you worried that you’re going to end up living on nothing but salad and granola? Does spending the entire month digging through Google for unprocessed recipes sound incredibly tedious? Eating unprocessed food for a full 30 days can seem daunting, especially if you’re new to this way of cooking and eating. I get all sorts of questions from pledge-takers — even folks who do this challenge on repeat every year — and everyone seems to share the same #1 problem: That frustrating moment at the end of the day when you’re trying to figure out what’s for dinner. I get it, because I’ve been there, too. (And far more often than I care to admit!) No one enjoys that blank stare into the fridge, stomach growling, with absolutely no idea what to eat. 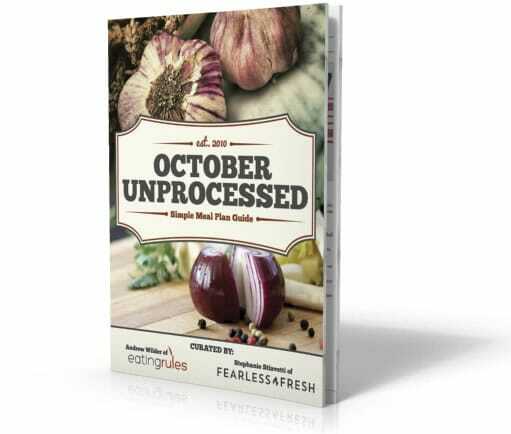 To help make your month of unprocessed eating easier, I’ve partnered with my friend Stephanie Stiavetti from Fearless Fresh to create The October Unprocessed Simple Meal Plan Guide. We’ve packed this digital download with more than 50 simple, unintimidating recipes that all pass the kitchen test. That’s an entire month of knowing exactly what you’re going to eat, setting you up to make almost no in-the-moment decisions about food. Okay, so the guide isn’t actually 3D… but I love this rendering! Additional chapters packed with our favorite breakfast, lunch, snack, and dessert recipes. Over 50 recipes to get you through the entire month of October feeling healthier than you have all year. We’ve put a ton of work into curating and organizing these recipes, designing a beautiful e-book, and creating the printable shopping lists (which will save you a lot of time and effort). Last year after October, we locked the price at $27.00. But because we want to help everyone succeed during the challenge, we’re putting the meal plans on sale for just $17.00. And, if you order before October 1st, get an additional $5.00 off with coupon code “unprocessed”. You’ve got to act quickly, though, because on November 1st the price goes back up to $27.00. And, for every purchase, we’ll donate 10% to the Food Literacy Center, an incredible organization that teaches low-income kids how to cook and eat real food. Changing the way you think about food is a big deal, but it doesn’t have to be full of drama and confusion. In fact, it doesn’t require much effort at all — if you’ve got the right roadmap in front of you. We’ve created this simple meal plan guide just for you, so you can spend the next 30 days loving this new way of eating, without any stress. Click here to get it. Have questions about recipes in the e-book? Hop into the Facebook group. Hi Dawn – so glad you’re going to join in! Since people often adjust recipes (even slightly), and we can’t control the exact ingredients used in many cases, we didn’t include nutrition information on the recipes. We suggest entering the recipes into a nutrition calculator with the exact ingredients you’re using so you can accurately track whatever information you need.